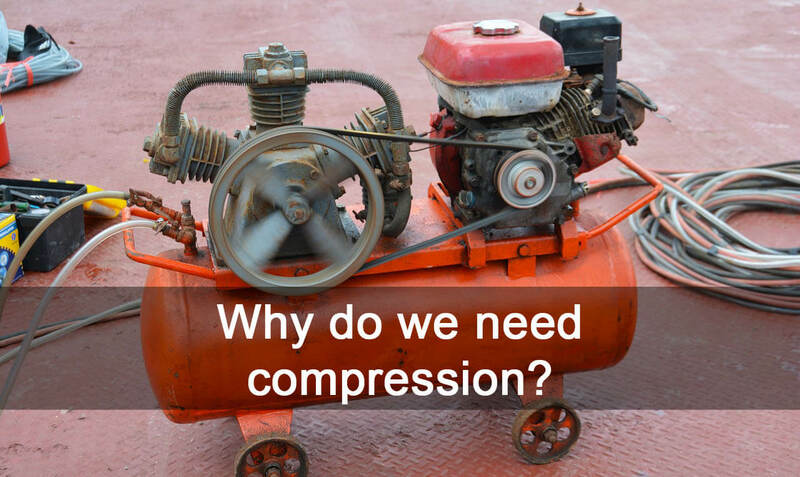 What is a compressor? Why do we need compression? A compressor is a mechanical device used to raise the pressure of fluids (gases and liquids). It takes a definite amount of fluid and delivers it at required high pressure. Its working is similar to the pumps. The compressor unit stores the compressed fluid in an integrated reservoir having a regulation mechanism for controlling output pressure. Compression has various applications. It is widely used in the industrial and domestic application. Overcome the flow losses - Flowing fluid experience frictional loss. Pressure is increased to overcome such losses. Static elevation of the fluid - Pressurize fluid to elevate fluid from one attitude to another. Power source - Compressed air possess pressure energy, this energy can be used later. This is helpful in a hazardous environment, e.g., in mines, the compressed air used to operate the machines. Small-volume storage of fluids - Some manufactured/ purified gases require compression to fill in the cylinder. e.g., O2 for medical purposes, acetylene for welding, LPG, diving cylinder, etc. Various manufacturing processes require compressed air to power pneumatic tools and hydraulic tools such as a jackhammer. They are used to blow molding (plastic bottles), for sand blasting. For pressurizing aircraft cabin at high altitude. In refrigeration and air-conditioning systems. Turbocharger and supercharger used in the vehicle are actually air compressor that increases the performance of IC engines. Some other uses compressed air systems are - spray painting, nail gun, hyperbaric oxygen therapy.